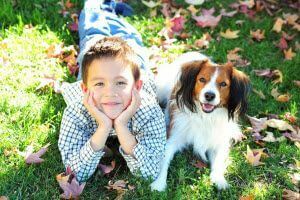 Fall lawn overseeding is an important component of maintaining a strong, healthy, and beautiful lawn. This is especially true if you have noticed any thinning of the grass this year. Plus, if your grass incurred any damage from pests or drought, those rough patches will fill in nicely next spring if you overseed this fall. Here are some more facts about fall lawn overseeding that you should know. Studies have shown that overseeding with grass seed and fertilizer in the fall can make your lawn nearly 50% thicker the following spring. This is largely because the grass has several months to build up strong roots. And treating with fertilizer in the fall, before the plants shut down for the winter, helps them store extra energy to encourage vigorous growth in the springtime. A thick, healthy lawn is itself a good pest deterrent and weed preventative. The better shape your lawn is, the better job it does of withstanding insects eating blades of grass. And remember that weed seeds need water and sunlight to sprout, just like any other plant. If your grass is thick enough to prevent adequate sunlight from reaching weed seeds, they won’t have the opportunity to germinate and tarnish your perfect green lawn. Therefore, fall lawn overseeding is a great way to thicken your grass. At the end of the fall season, a trick most people don’t know about is mulching the grass. If you have fallen leaves on your lawn, simply run your mower over them and leave them on top of your turf. Winter lawn applications can be put right on top of the leaf mulch, which will help nourish and protect your grass during the winter. Plus, you won’t have to rake, bag, and move all those leaves! This point may be the furthest thing from your mind, but it’s important to consider. If there is any chance you may put your house on the market in the next year, getting on a lawn care plan right now is important. When a potential buyer visits your home, the first things they see are the home’s exterior, the roof, and…the lawn. A lush, green lawn will always give a better first impression than a thin, brown one. 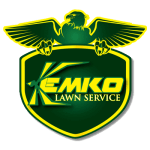 Kemko Lawn Service offers a full line of services including fall lawn overseeding for clients in the Atlanta area. Fall is a great season to get on a lawn care program. It’s prime time for preparing your lawn for greatness next spring. One of our lawn care experts can visit your property and assess the condition of your lawn. And our expert will then recommend a care plan to improve your grass’s health and appearance. Maintaining a lawn care schedule with Kemko year-round ensures the continued beauty and vitality of your grass. Call us at 770-466-6113 to schedule your fall lawn overseeding.